Most of my writing these days is in the form of journaling, but earlier this year I submitted some of my embroidery work to an anthology about “challenged bodies” and creative work. 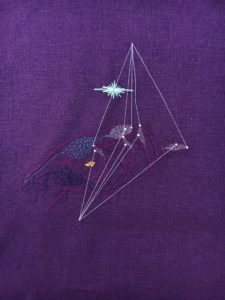 As part of the In Corpore Sano anthology I was asked to write about my experience of being a creative person living with a debilitating illness and wrote a fairly long essay about that as well as the autobiographical and therapeutic nature of my embroidery work. push pull and tingle (2018) An embroidery illustrating paresthesia and tension in my hands. Cotton and silk thread on linen. In Corpore Sano will be a print anthology published by The Operating System in the US in March 2019. There will also be a series of writings, with some of my embroidery pieces as images, published online through Medium. The first of these is an essay on the process of editing the anthology by one of the editors, Lynne DeSilva-Johnson. Editor Amanda Glassman will be curating the online essays. Jay Besemer is co-editor of the print anthology. You can pre-order the print anthology and see one of my embroidery pieces if you click through. I’ll do my best to update here with links to the online essays before the March publication of the print anthology. In other recovery news, I am now able to listen to music on speakers for fifteen minutes at a time and have begun to play the piano for 2-3 minutes on my good energy days. Recovery from ME/CFS is slow but carefully dealing with the hyperacusis (extra-sensitive hearing) has meant I can have at least some music in my life again. I cannot sit at the piano long enough to compose but that is my goal. In the meantime I shall continue to write and embroider. This entry was posted in anatomy, embroidery, lit, Uncategorized and tagged embroidery by Lia Pas. Bookmark the permalink.